Seated: Mariano A. De Carolis, General Manager. 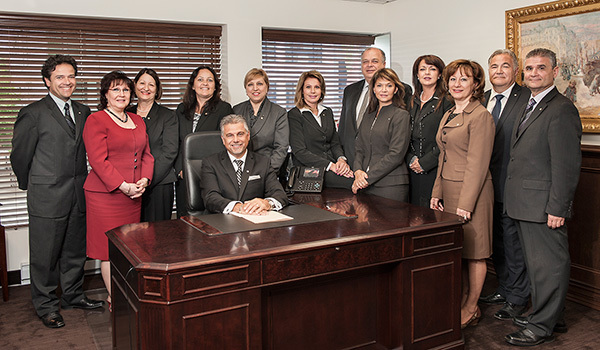 Standing, left to right: Luigi D'Argenio, Manager, LaSalle Service Centre; Sara Falci, Manager, Saint-Jean-de-la-Croix Service Centre; Marcella Di Lillo, Manager, Henri-Bourassa Service Centre; Monique Nault, Manager, Administrative Services; Michelina Lavoratore, Manager, Personal Services and Business Development; Maria Biondi, Manager, Jean-Talon Service Centre; Carmelo Barbieri, Manager, Maurice-Duplessis Service Centre; Ermes De Dominicis, Manager, Wealth Management; Rita Tamburro, Manager, Fleury Service Centre; Maddalena Baviello, General Management Assistant; Sandro Fabrizi, Manager, Jarry Service Centre; Giuseppe Guerrieri, Manager, Petite-Italie and Papineau Service Centres.